To say that the foodie movement has taken over would be an understatement and it is not necessarily a bad thing either. The one key thing that this food craze has brought forth is all the untapped, raw, and creative cuisine from chefs all over the globe. Food is the new universal language and we all speak it fluently. Long Beach has been a destination for cuisine for quite some time now, but ever since the foodie boom Long Beach now has hotspots that can hold their own. One of the hotspots is BO-beau kitchen + roof tap located on Pine Ave. in Downtown Long Beach. BO-beau kitchen + roof tap is approximately 14,000 square feet of boho-chic interior with an industrial edge that is as visually appealing as it is inviting. Bo-beau has the physical presence to be a hotspot but we all know that isn’t all. On the second floor of Bo-beau there is a brick-and-mortar inspired scene that serves 50 rotating taps year round that will tickle your every fancy no matter if you like thicker brews or light ales or IPA’s, and as if that wasn’t enough to blow your mind Bo-beau has some of the most succulent dishes around. Executive Chef Katherine Humphus delights us with her creativity on classic French dishes by adding modern twists. 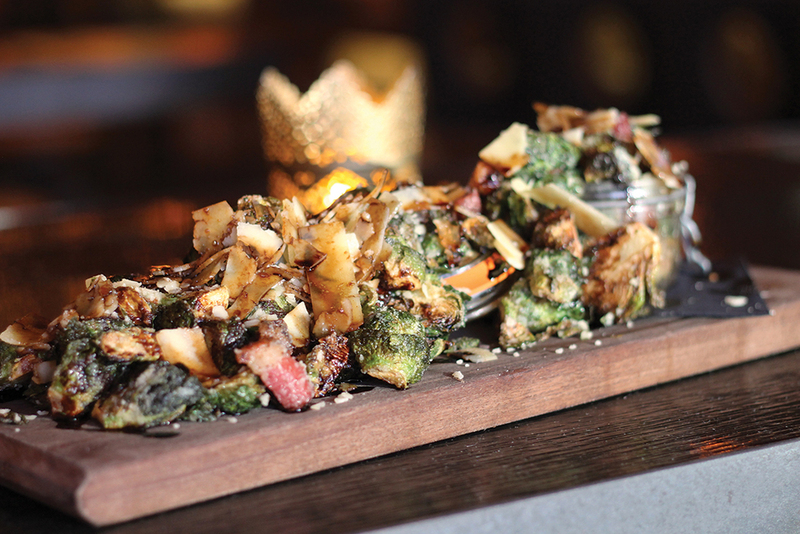 Some of the most celebrated dishes at Bo-beau are the crispy brussel sprouts that are beautifully dusted with pancetta, balsamic, and parmesan. Another favorite dish is the brown butter seared scallops with pear-marscarpone ravioli. Need I say more? I had the opportunity to ask Humphus what her favorite dish is and she enthusiastically shared with me that it was none other than the duck confit fettuccini because, “it’s so rich, it warms the soul.” The menu at Bo-beau changes about four times a year so that they are always fresh with beautiful dishes that help embrace the seasons and their patron’s taste buds. When asked if Humphus could use one word to describe Bo-beau she decided on the word “enchanting” and I would have to agree with her. Here is where I give you all the essentials about Bo-beau that will help maximize your experience. Bo-beau is open every day and offers a “social hour” Monday through Friday from 4:30 p.m. to 6 p.m. where you can have a great time exploring all the options on tap. The Bo-beau kitchen is open daily at 4:30 p.m. downstairs, and the Bo-beau roof tap is open upstairs at 4:30 p.m. Monday through Friday and at 2 p.m. on Saturday and Sunday. I would urge you all to go to Bo-beau so that you may be enchanted by Chef Humphus’ passionate dishes and allow the ambiance inside to transport you and your friends to nirvana. This is the place to be!